1. Should I rent a car? 2. Are the roads safe? Yes, they are safe. Our 4 lane highway was completed a few years ago . This increased the safety of the road and shortened the trip time from the airport to us and vice versa. 3. How far is it from the airport to Cerritos Beach? It is approximately 1 hour and 15 minutes. Cerritos Beach is only 40 miles North of Cabo San Lucas on the Pacific Ocean side. 4. Are there restaurants near by the resort? Yes, on site, Napoli is open year round. You can also drive into town. El Pescadero is 5 minutes away and Todos Santos is 10 minutes away. Both towns have fantastic restaurants! Definitely try Freesouls @ Cerritos ( 2 blocks away), Herbabuena in Pescadero, Carlitos restaurant in Pescadero, and Café Santa Fe, Miguels, Tequila Sunrise, and the Hotel California in Todos Santos. Two new options on Cerritos Beach include Baracuda Cantina and Shaka's Cantina. 5. What is the Cerritos Beach Club? 6. Are there places that rent surf and boogie boards on the beach, wetsuits, etc? Yes, there are 2 surf shops at Cerritos beach that rent surf boards for only 20 US dollars a day, as well as some surf wear. Also, there are surf instructors that give private and group lessons. Just let us know and we'll help get you scheduled. 7. Is there night life? Not a lot , however you can find live music on the weekends at the Hotel California. Other than that, it is pretty quiet up here on the coast. Cabo is just down the road. (35 minute drive from us). 8. Is the beach safe? Cerritos Beach is the only safe swimming and surfing beach on the Pacific for hundreds of miles. However, like the ocean anywhere, please use caution! Life guards are on duty most days. 9. What about the crime? We have all heard the horror stories. Our area of Baja is very safe. What you see in the news, that’s Mainland Mexico. We are away and far from the rest of the country. 10. Can we pay in US Dollars? Everywhere accepts US dollars. You will get your best exchange rate at bank ATM's, don't forget to let your bank know your travel dates so that they authorize the ATM and credit card charges. 11. Will my cell phone work? AT&T, T-Mobile and GSM based providers works very well. Please check with your phone company to see if there is anything special you should do before you travel. There may be a Mexican rate plan you can have while you are on your trip. There are also prepay phones you can buy for 30 US dollars with minutes included that you can get from any cell phone company here in town which will work very well, also is very cheap to call the US. You can pick up phones at the Telcel stores, or the local OXXO stores. We have a US / Canada phone in the office that you can use. 12. How far is the closest grocery store? There are vegetable stands and grocery stores 5 minutes away in Pescadero and in Todos Santos, 10 minutes away. Brody's neighborhood tienda, is on the left side of the road as you drive in. 13. Can we buy food and cook ourselves? 14. Does the resort have internet? Yes, a number of the homes have WiFi in the unit, otherwise it is available at the pool / palapa. (no charge) Please Note: Wi-Fi speeds are very limited in our area, Wi-Fi is subject to availability. 15. Is there TV at the resort? Some units have satellite TV, others have DVD players, ( large collection of DVD’s are in the office), others do not have TV’s or DVD players. Yes, traveling from almost any country to Mexico requires a Passport. 17. What airport do I fly in to? We are located right in the middle of 2 international airports: San Jose del Cabo (SJD) and La Paz International airport (LAP). La Paz is a good option but it doesn’t have as many flights. Most people fly in to San Jose del Cabo. 18. Is the Resort kid friendly? Yes, it is definitely a kid friendly resort. 19. What kind of kid activities are there? We have a pool and the ocean is safe for kids (always use caution in the ocean), there are surf lessons, boogie boards, horseback riding, ATV and dune boogies, drinking smoothies at the beach club and WiFi. 20. What else is there to do? 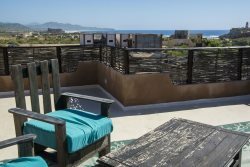 Todos Santos is known for its art galleries, world class cuisine, its historic mission and regional museum, as well as many boutiques and bookstores. Anything you could possibly want is down the road in Cabo where there is a great nightlife, discos, fishing, golf, fine dining, snorkeling, and shopping malls. You can find organic grocery stores (with items for diet restrictions), as well as Starbucks, Costco and Walmart. Sunscreen, bathing suit, sunglasses, a hat, sandals, shorts and t-shirts, camera, a good book and maybe your laptop. Bring casual clothing. For girls, shorts and summer dresses work great. For the cooler evenings, a sweater is a good idea; even the nicer restaurants are always semi casual. Just pack for the perfect summer day. We are pet friendly, but prior approval is needed by the individual unit owner, unless the unit already allows in the property listing. All pets must be one leash. In the past we were on a generator, the power company now delivers our electric power. But, not not un like other remote areas in Baja, we can experience short interruptions during stormy weather. The outages usually last from 1 -3 hours. We do have a generator for the areas around pool palapa.